Today, Strobe Inc. is launching a new platform that helps developers build HTML5-based Web applications for desktops, smartphones and tablets, and centrally manage them from a single interface. The launch is a major leap forward in HTML5 app development. 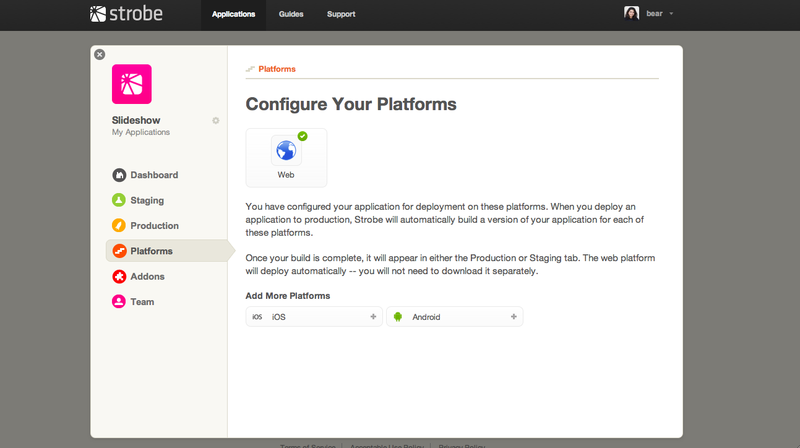 From one interface, teams can manage code (both test code and production code), configure the app’s deployment across platforms (Web, Android, iOS, etc. 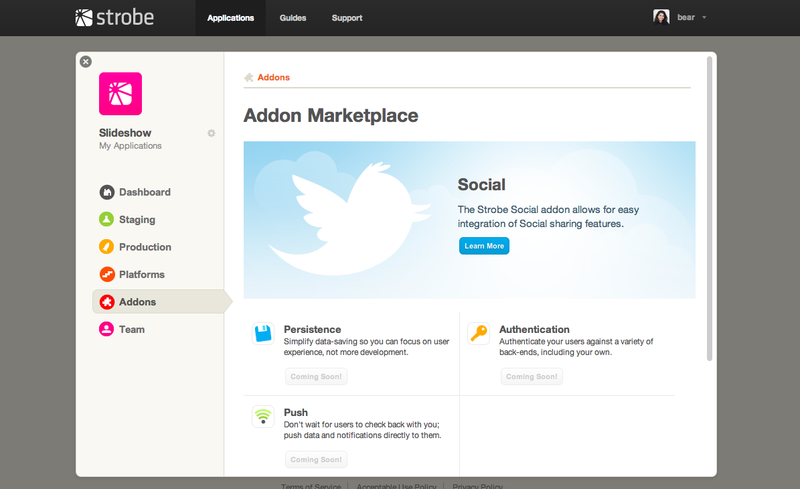 ), add additional services (social, push notifications, authentication, etc. ), and even track analytics within an easy-to-use dashboard. In addition to SproutCore, Strobe also uses PhoneGap, the popular HTML5 app platform. PhoneGap lets developers author apps using Web technologies then deliver them in a native wrapper to the iTunes App Store, Android Marketplace and other app stores. It also happens to integrate nicely with SproutCore. Update: To be clear, Strobe works with any HTML5 framework, not just SproutCore. Although the Strobe platform aims to offer a complete set of tools for building apps and deploying them across platforms, while in beta testing, some of Strobe’s features are still limited. For example, the analytics product is coming in a few weeks and the only mobile platforms supported at this time are iOS and Android. Also, the social addon, which lets developers add Facebook and Twitter sharing features to their apps, is the only one available now. But these are only temporary restrictions. Strobe already has plans for more platforms on its roadmap, and will soon launch addons for authentication, push notifications and persistence (data-saving). In some cases, Strobe will write the addons itself, but in other cases, it will partner with service providers. Although no deals have been confirmed at this time, backend-as-a-service providers like Parse and StackMob immediately come to mind as good fits for Strobe integration. By combining an app’s desktop Web version with its native version (built with Web technologies), Strobe isn’t just simplifying the development, deployment and tracking of apps, it’s also opening up more mechanisms for discovery too. Strobe developers can configure the Web version of an app to point to the native app, in order to help convert the app’s casual users in more engaged native apps users who are more likely to spend money on virtual goods and upgrades. Also, by typing the two experiences of native and Web together, the Strobe social addon can be configured to help users share exact points within a mobile game, for example, which anyone on the Web could click on via a shared link, and immediately play. That’s potentially a discovery tool more powerful than rankings, press releases, blog posts, recommendation engines or monetization schemes. Discovery, which is one of the toughest challenges the app industry has ever faced, is the ultimate end game for Strobe, and the HTML5-powered apps it helps build. The Strobe developer preview is now open and pricing info is available here. Strobe previously raised $2.5 million Series A in December, led by O’Reilly AlphaTech and Hummer Winblad. It will raise another round closer to the time of its public launch, planned for later this fall.